I must admit, it’s becoming harder and harder for me to find new (that I don’t know about) popular services and review them. What’s popular? In my opinion, a site is popular if it is inside Alexa’s top 10k world most popular sites. It is very objective, and may not even be true, but this is an easy way to estimate site’s popularity, so i use it. and so today’s subject is y2mate.com – a website up in those 10k, so .. a rather popular one. as popular as Listen To Youtube that’s been gone missing lately. then there’s mp3 conversion service, nicely presenting mp3s as 128kbps, thus not asking for any extra data transfer. Not upencoding to 320kbps either, what makes files 2.5 times larger without any sound improvement. Good job!! Then there are also other audio formats available, such as m4a, webm, ogg.. And smaller video formats can be downloaded too. A bit complicated especially for a new guy who knows nothing about HD or other formats..
One can translate this site into several languages. This often helps the popularity, because local site versions can produce mad traffic. Finally, this site had NO ADS. this is amazing and is really inviting, to say the least. But, this site does promote 2 different android apps. One would be MuviDownloader App and another Vidmate HD Video Downloader. I am not sure which one was developed by y2mate’s team, probably the first one, if any.. I did see ads for the other one on other sites. This is normal, for sites to offer Software Installs. For example, we here on savetube are (at the moment) recommending this Airy HD Video & Mp3 youtube Downloader, it’s a nice piece of software, that has versions both for Windows and Mac, so – check it out! Doing this will quickly send you to the step 2 of this tutorial, avoiding step 1. This seems like a recent innovation site’s operator has instroduced. Good job, makes it exactly as ssyoutube trick employed by SaveFrom, and some other services do it too… Saves a few seconds, it does.. 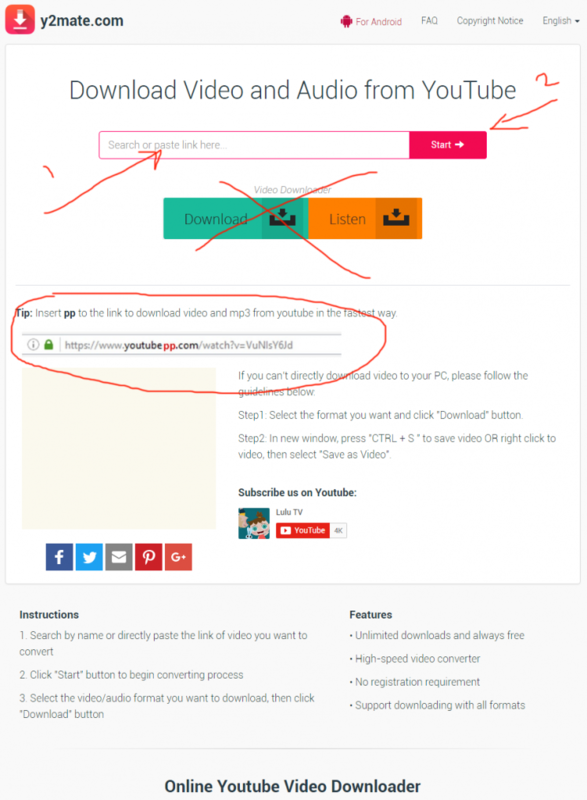 In the box i denoted with the arrows, paste your video link URL. See how y2mate.com quickly shows video info and a panel with MP4, Mp3, etc tabs, where you can select download format. We first go for the 720p HD video, and click the download button shown by the arrow. Download happens directly from youtube (super fast), file is properly named, kudos!! this step has set me back a little. But let me get to it later. Simply click the mp3 tab link and see the offered mp3 format for download.. At the same time do not click green Download or orange Listen buttons, they will both throw you to the Vidmate installation site. I have purposefully crossed them our in every screenshot where they are visible..
And so let us do a quick review. Which also can serve as conclusion below… But here’s what I’d like to say about y2mate… It’s a good service. It does what it promises to do, it only goes for 128kbps mp3 – honest and data transfer aware..
Site has mobile version that looks good on a smartphone.. Why those apps then? Truly i don’t get it, why some people would use apps, when using a website is so much easier and faster? Yes, desktop software is a different thing, it’s so much easier to use (as for example Airy is). With desktop, you can set a dozen videos to be downloaded and converted, leave it overnight, have it done when you are not around.. Conversion happens so much faster, because your desktop (or good laptop) is way more powerful than your smartphone or tablet, it has way bigger screen, normal mouse… Well, it’s it just so much nicer to use..
Y2Mate.com is a nice site without ads or popups, no advertising whatsoever, at least now end of 2017… Site is safe, does its own youtube to mp3 conversion. So – it’s a great resource with lots to give. It also advertises 2 android apps which savetube doesn’t vouch for (at least yet). I use youtube to mp3 converter to convert my youtube videos to mp3 format. It’s a free tool, no, need of registration is required. Just copy youtube video URL and paste in the search field there and download converted mp3 music. Try out yourself. I used Tubidy site for free MP3. its a best site for unlimited downlaoding. 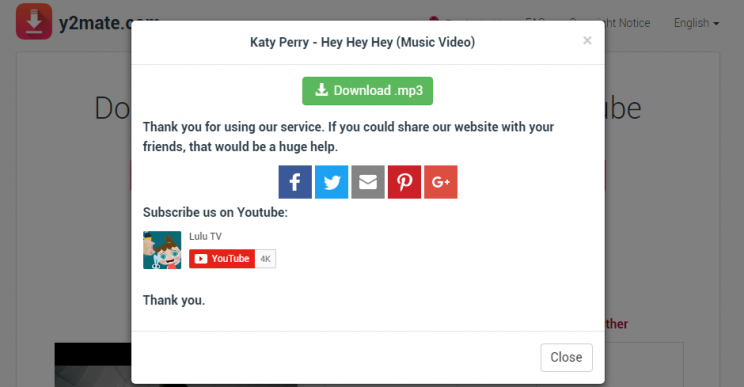 It also provides a tool for convert YouTube to MP3 using this URL tubidy.media/youtube-to-mp3-converter. Hi, just a question. After I download the song from y2mate if I wanted to plug it in to something like a music system that does not have a CD player because I’m doing a play how do i do that? Do i use my phone cable? it depends what connection the sound system has. you can usually either use usb cable, or double-ended audio cable for older systems without usb. normal audio jack cable, like on headphones.. use line-in for that..
All those who are fond of music must have heard about Online Video converter because a number of users rely on this astonishing Free video converter to save their favorite media file. I used y2mate and it works well, i also suggest planetlagu for better solution. Its really simple too wihout any plugins and ads! I have used it for many years to download from Youtube. y2mate is a very simple tool to use without any ads or no need to any type of registration, but i also recommend mp3juices which works the same as y2mate. I recently tried to use y2mate as I have used it for a long time and don’t use or go to any other sites but unfortunately pop ups that forced me to close. Beware! I have been using y2mate but recently got pop ups/scam ads that forced me to close the browswer. Beware! I have a problem, I can’t find the items that I downloaded on my Chromebook? I’m having this problem. Can’t find the downloads. Did you ever manage to find them?